For additional information about this book, visit the website www.stonewallfreedom.com. In 1749, pirate captain Giddy Gilcox and the crew of the Rogue Flatterycommandeer a Spanish galley, intent on plundering its cargo, killing all aboard, and scuttling the ship. Gilcox discovers, however, that the ship’s hold is filled with human cargo—African tribal people, enslaved workers bound for Spanish America. Gilcox’s crew bristles—they’ve heard stories of Black Sam Bellamy meeting his death after overtaking a slave ship. Later, Gilcox captures not only a fortune in gold but also Helen Tanner and her young son. 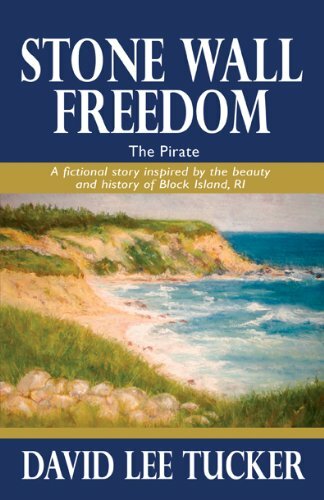 Upon reaching Block Island, the pirates anchor the Rogue Flattery and bury their treasure, but the feeling of dread from the Spanish slave ship haunts Gilcox. Could the spirit of the slave ship be responsible for the nor’easter that blows in as they prepare to leave the island? Building on Block Island’s history of pirate legend and lore, Tucker has created a story at once thrilling and poignant, full of evocative language, as mystical and magical as Block Island itself. Stone Wall Freedom - The Pirate Awarded Honorable Mention for Best Fiction in 2010 from the Connecticut Press Club. David Lee Tucker resides in Trumbull, Connecticut, with his wife and three children. He has an undergraduate degree and an MBA in finance from the University of Connecticut. He is currently employed as a retirement benefits executive with a Fortune 100 company headquartered in Stamford, Connecticut. Mr. Tucker owns a summer residence on Block Island, Rhode Island, located on High Street. He is a published author of poetry and nonfiction articles. Stone Wall Freedom - The Pirate is his first book.